The Department of Medical Examination and Treatment yesterday sent its document to its sub-department in the northern province of Yen Bai asking to issue punishment on the man who assaulted doctors. The Department of Medical Examination and Treatment under the Ministry of Health said clearly in its document to require investigation about the assault on doctor who stopped a man from taking photos of C-section in the Maternity hospital in Yen Bai as per the Health Minister’ guideline No. 03/CT-BYT on security in hospitals. Moreover, the local department of health must visit the doctor who was beaten while giving treatment to a patient. Before, on February 20, the local hospital admitted 25 year old pregnant. After examination, doctors decided to perform C-section on the pregnant woman. While performing the operation, surgeon team discovered the pregnant’ relative to take photos; accordingly, medical workers asked the man to leave the ward; however, the man has insulted the surgeon team threatening surgeons. Despite this, the operation was successful at last. 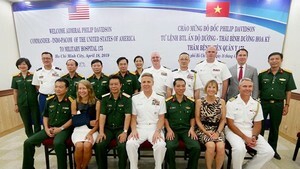 Two surgeons Pham Hai Ninh and Hoang Duc Trung stepped out the operation room, they were attacked by a group of people. Consequently, Dr. Ninh had to have 20 stitches because of two wounds in eye and head. The hospital called for assistance of body guards and took the two doctors to big hospital for emergency. Director of the Department of Health Dr. Nguyen Van Tuyen said that he sent a report to People’s Committee and the Ministry of Health requiring a probe for the case as per the law. At present, police investigators in Yen Bai are carrying out the probe.